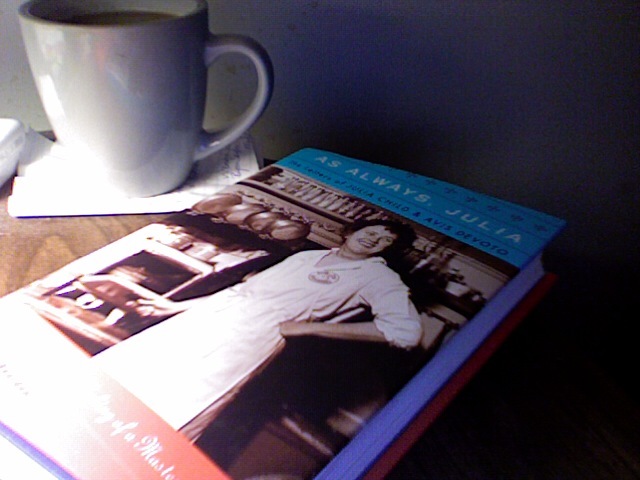 30 pages to go in the book "As Always Julia" I wasn't aware just how political their letters were to each other. Oh My God! You get a lovely view of their desire for food in the beginning stages of Julia Child creating Mastering the Art of French Cooking, and their devotion to their husbands -both Julia and Avis DeVoto- but the politics! I've never been into politics on this kind of level, and to be nose deep in American politics in the 1950's... I've been finding those parts of the book just too much. And I keep trying to figure out how to translate your american parties to Canadian and well, as I said, I've never been interested in politics so it's just gibberish to me. I went to college with a guy who did nothing but talk politics all day long. He's our city's NDP rep now. I understood it about as well back then as I do now, which is to say... I just do not have a taste for politics.